The History of the Tower of London is great, bloody and cruel and the White Tower has its part to play in its story. The White Tower is just one of the 21 towers which, together, form the Tower of London castle complex. The Tower of London covers an area of 18 acres and its magnificent architecture covers almost all the styles which have flourished in England. Although the Tower is no longer a place of great military strength it has in time past been a fortress, a palace, and a prison. This section provides key facts and information about the White Tower. 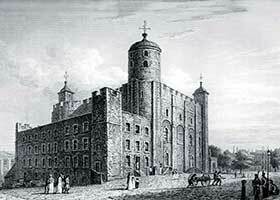 Who built the White Tower in the great Tower of London castle? Place of torture in the dungeon which became known as "Little Ease"
Extensive building and repairs work to the Royal Lodgings was conducted under the orders of Henry VIII in preparation of the coronation of Anne Boleyn. The work was supervised by Thomas Cromwell. This included the repair and decoration of the magnificent Great Hall and new chamber for the Queen. William the Conqueror built the White Tower. It is the most famous Castle Keep in Great Britain and situated on north bank of the Thames River. Construction of this famous castle keep started in 1078. The basement was believed to have housed the dungeon known as "Little Ease." The basement of the White Tower was believed to have housed the notorious dungeon known as the "Little Ease". This terrifying chamber was built in the thickness of the wall and measured just 1.2m square (4sq ft). The hapless prisoner of the 'Little Ease' could neither sit, stand, nor lie, but was compelled to serve his sentence in a cramped and crouching position. Guy Fawkes was shackled hand and foot in the ‘Little Ease’ following his arrest for his part in the Gunpowder plot. On the 5th November 1605 Guy Fawkes was caught in the cellars of the Houses of Parliament with several dozen barrels of gunpowder. Guy Fawkes was subsequently tried as a traitor with his co-conspirators for plotting against King James I and the government. Fawkes was sentenced to death and the form of the execution was one of the most horrendous ever practised (hung ,drawn and quartered) which reflected the serious nature of the crime of treason. The very walls of the White Tower contain some of the bloody secrets and of the history of the Tower of London. Which King was responsible for building the White Tower and what was his reason? When was it built? Interesting facts and info about the history of the Tower of London!